A black and white portrait from the papers of Mary E. Dawson, a dancer born in Philadelphia who became known in the entertainment world as Mademoiselle Fifi. 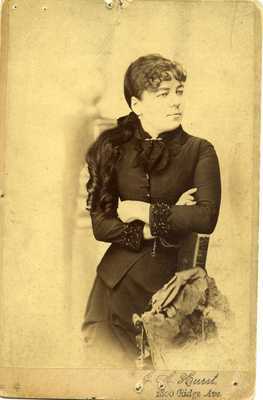 Handwriting on the back of the photograph appears to say, "Fifi's Mom, My mother at the age of 17, Alice Eckroth from Cressona, Pa." The photo is stamped with a studio name and address, "J.A. Hurst, 1800 Ridge Ave."